We stayed here for a family vacation and it was lovely. Perfect blend of mountain cabin and modern amenities. The rooms were cozy and well furnished. We added the guest house and it made a perfect hang out for the kids while allowing the main cabin to stay a bit more relaxing for the adults. It was only about ten minutes from town (Bryson City) which is a picturesque little town with cute shops and a train depot. Overall we had a great vacation and the friendly staff at GSMCR made it that much better!! Highly recommend for a delightful mountain stay. Staff was very friendly and helpful with directions and overall advice. With every interaction with the staff, I found them to be friendly, professional, helpful and responsive. All very positive! Kelley was the best agent I've ever dealt with when renting a place to stay. Extra helpful and was there when I called with questions. Thoroughly enjoyed our visit. Cabin was lovely set in a beautiful area. Enjoyed having the notebook with the suggestions of activities. Look forward to a return visit. Great, helpful information was given on the area. Excellent recommendations. 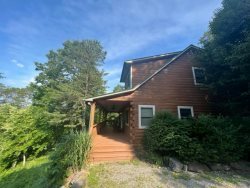 A great, well equipped secluded cabin to fall in love with nature and your family all over again. WE enjoyed our stay at this cabin. We are coming from Philadelphia and Fayetteville, NC. The drive was 5 hours, but the trip was worth it. Morning Sun Retreat is absolutely beautiful and the scenery is divine. Your registration person, Cathy, was exceptional. She handled all of my questions with ease and offered suggestions based on what I was looking for. Availability and price of this property. Since we had stayed here before, we knew how far away from town the property was. Celebrating my grandmother's 94th birthday. She and my grandfather used to keep a camper in Cherokee. We have traveled for summers to Cherokee to stay for over 40 years. Bryson City is close enough to visit Cherokee and the cabin provides better accommodations for a group. We rode through Bryson City, dined at Jimmy Mac's, and visited Cherokee. Mostly, we stayed at the cabin.